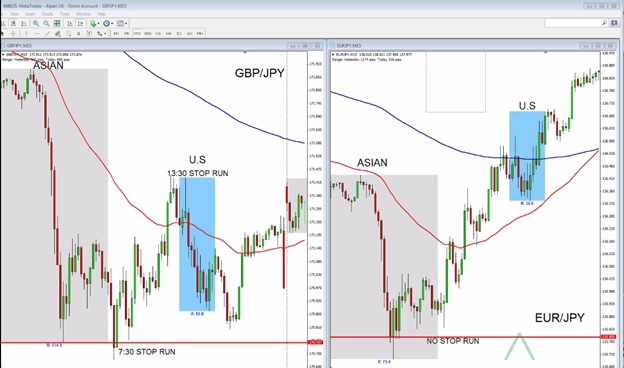 In this section, you’re going to learn a potent technique that would allow you to confirm that a stock one has taken place and also increased the probability of thriving trade and we do this through the use of currency correlation and stock hunts. 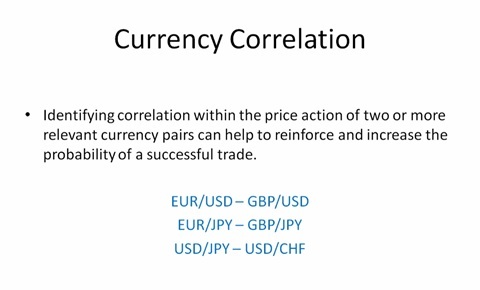 So identifying correlation within the price section of two or more essential currency pairs can help to reinforce and increase the probability of a successful trade. I assume you learnt that many currency pairs will move in line with each other the majority of the time and examples of this were the euro-dollar and the sterling-dollar the euro-yen and Estonian yen and also the dollar-yen and the Dollar-Swiss. So when stock runs or M and W formations at identified manipulations zones take place at the same time in correlated pairs, the probability of a successful trade is significantly increased. So with merely looking for the stock run that we have identified or the M on W formation that we have identified is a manipulation zone to take place in a highly correlated currency pair. If we’re looking at the euro-dollar, we’ve determined through candlestick formations, a stock run taking place at an identified level, and then we flick over to the sterling against the dollar. We see a stock run on M W formation taking place at the same time at an identified level the probability of a successful trade will be significantly increased. Because we’re seeing the stock run of two correlated pairs taking place within a relatively narrow time-frame. 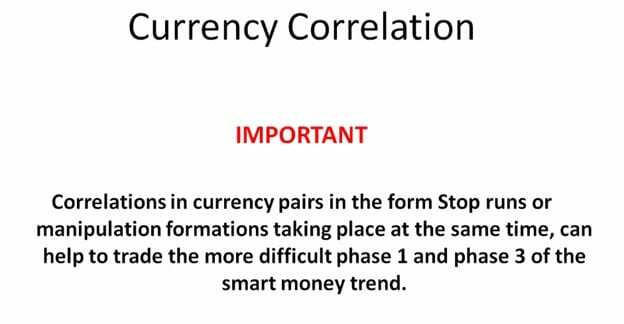 So checking for correlation between two pairs and the respective cross pair can help you to identify which currency pair has the most potential for a more significant return. So what do I mean by this, well, if you’re looking at the euro-dollar and the sterling against a dollar and you have identified that a stock mine is taking place within a relatively narrow timeframe at defined levels, you will have the problem of choosing which currency pairs to trade over the other. Now, if you’re more comfortable trading the euro-dollar over the sterling-dollar, than by all means take your trading the euro-dollar and vice versa. This doesn’t necessarily mean that you’re going to get the most significant return and the way that you can look at what currency pair is potentially going to give you the most significant move and the highest return. You will do this by looking at the respective cross pay and in the example, I’ve given, this would be the euro against the sterling. Okay in this first example we’re looking at the euro-dollar and also the pound against the dollar, and the date is the 20th August 2014. On both the charts I’ve marked off the Asian highs as represented by the red line now in the euro-dollar we get the first test that a high which takes place at eight o’clock. We can see smart money having buyers into the market which smart money was selling to with this aggressive move to the downside, and then we get our second bar which fails to confirm because it does not close within its lower one-third region. We then get a bounce to the upside and the second test of the Asian highs. We get another stock candle which is later confirmed down, and then we get the trend to the downside. Now for those of you with a sharp eye, you will notice that we have our classic information take place and we have the shorter second leg before the market begins the daily trend. So we have the first stop run takes place at 8:00 which is the first leg of the information and then we get a second test of the Asian highs which formed the shorter end information at 9:15. Now if we switch over to the sterling against the dollar; we notice that at 9:15 we also get a stop one of the Asian highs. 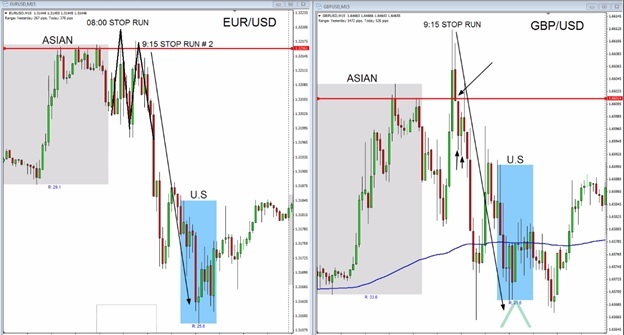 We have a correlation of stock hunts on correlated pairs in the euro-dollar we had the second leg of the information which penetrated the Asian tops and at the same time on the sterling against the dollar we had an aggressive move to the upside with Smart Money in buyers into the market. We then see an immediate rejection following our stock one candle we get a higher low. So this becomes our new Stockman candle and then we get our confirmation and then I’ll pull back candle take place. So at quarter past nine on both the euro-dollar and also be sterling against the dollar we had a stock run of the Asian highs on the intro day session, and then we had confirmation and then the unfolding of the daily trend. A very simple and straightforward you merely looking for two correlated pairs that had stock runs and identified areas of deep potential liquidity taking place within a relatively narrow time-frame at a time doesn’t have to be exact. In this example, you saw we had a stock one at eight o’clock on the euro-dollar up, but we didn’t have one on cable or the sterling against the dollar. But then we had the second leg of the information come back up and test the highs and this correlated with the stock one on the stand against the dollar. Now once we’ve seen the correlation between stock humps on both the pairs for traders that don’t have a preference between the currency pairs that they trade but are simply looking for the greatest returns. How do we identify which one of the pairs will give us the greatest move? Okay so if we measure the high to low range of the trends on the euro-dollar, we have a fifty-eight point nine points, so we say 59 points. On sterling against the dollar, we had forty-six point, so clearly, the euro-dollar would be giving you the most excellent return. But how do we work out beforehand which is likely to do so well we simply go to the cross pair of the two respective charts so we you look at the euro against the sterling case? If we go over to the euro currency sterling and again we’re on the 28th of August 2014 now at 8 o’clock which correlates with the first stock run on the euro-dollar we can see a stock run of the Asian highs okay so we can see that’s smart money is inducing buyers into the market and they’re going to sell into this and fall be trend to the downside, so this currency pays to be the euro-sterling. If we identify that in inducing buyers into the market so they can sell into this buying pressure then the smart money analysis of the euro against the sterling is euro weakness, because if they’re selling to the buyer in pressure and we know they’re going to push the market to the downside their analysis is that euro against the sterling the euro is weak, and sterling is strong. So if we look at that and we know that on both the sterling the U.S. dollar and the euro against the dollar bear we’re currently in a downtrend. We’re going to be looking to trade the euro because the euro against this sterling the euro is weaker and this Sterling is strong, and if you are in a downtrend on both of these respective pairs then when one trade the weaker currency pair. So we see a stock run of the highs and then gets a low a high so high a little take place. We then get confirmation, and we get our pull back candle. So if we have euro weakness regarding the pace that we want to trade out of the two correlated stock runs, we’d be looking to trade the euro-dollar. In the next example, we’re looking at another set of highly correlated pairs, and this is the sterling-yen vs the euro-yen, so we’re looking for the same process as we did in any last example. We’re simply going to be looking for the manipulation of retail orders at an identified level within a relatively narrow timeframe. In this example, I’ve marked off the Asian lows as our potential manipulation area, and in the Sterling- Yen, we see 7:30 we get an aggressive candle to the downside which penetrates our zone by three points. This becomes our Stockman candle and then immediately afterwards we get a candle which closes above the body of our stock one candle and gives us confirmation of manipulation. Now in the euro-yen, we have no manipulation of the Asian lows. So if we have no manipulation of the Asian lows does this necessarily mean that we don’t take a trade. Well of course not, we always keep in line with these smart money cycle. 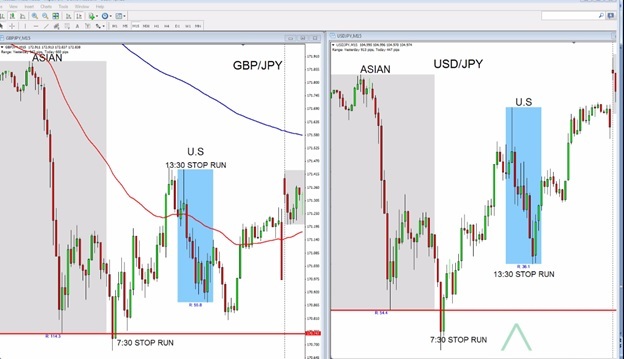 This is a process that you can use to reinforce and confirm a trade entry decision. Okay so in this example we have no stock run at Euro-Yen at 730, but we have an apparent stock hunt and confirmation in the Sterling-Yen. 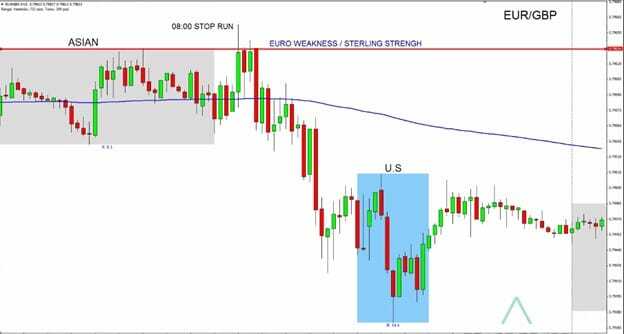 There is another currency pair that we can use when we’re trading the sterling yen and euro yen, and we can use this other currency pair also for correlation and confirmation, and this currency pair is the Dollar-Yen. So far probably Dollar Yen, immediately we can see that we have an identical stock run to our sterling, at 7:30 we have a stock one of the lows with an aggressive candle which penetrates our level by more than three points. We then have a failure to confirm, but we have a low a high. We then get our confirmation candle which closes within its higher one for the region and then we receive our pull back candle. So within two currency pairs which are highly correlated the Sterling yen and also the Dollar-Yen we have stopped runs of the Asian lows. Now what’s interesting is as we enter into the U.S. session and if we mark off zones at 1:30 as the U.S. session opens we have a stop run of a previous level of support of resistance, and we get the same process takes place within the dollar yet. Okay, so this could also be used to assist you when trading the New York reversal. At 1:30 as we enter into the U.S. session we have a stop run on both of the highly correlated pairs and we get confirmation down on the next bar. Here would give you more than enough reinforcement and confirmation that stock hunt had taken place and allow you to pull the trigger and enter the New York river comfortably. So it is also true with the previous two pair we looked at during the midweek reversal if you see a correlation of stock hunts to the up or downside take place within a relatively narrow time frame you can pull the trigger with that added confirmation that the highly correlated pairs are also doing the same thing. 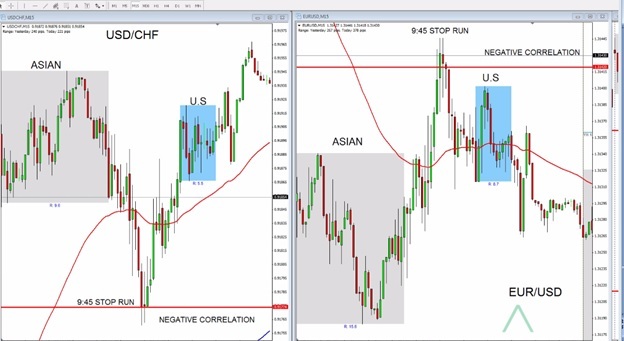 In this final example, we’re going to take a look at two currency pairs which have a high degree of negative correlation and in the cases where you’re dealing with two currency pairs that do have a negative correlation you simply want to look for the same process. But on the other end of the trend so, for example, we’re looking at the Dollar-Swiss against the Euro-Dollar, and they are profoundly negative in their correlation. So if we’re in a bear trend on the Dollar-Swiss and we see manipulation, and we also see the same manipulation taken place in a board trained on the Euro-Dollar then the stop hunts will be correlated. So in this example, we’re looking at the first the September 2014, and we can see that the Dollar-Swiss is in an apparent move to the downside. We have a previous level of support resistance have marked out, and we can see through the candlesticks that we have that aggressive move through our identified zone. Our next candle gives us a low a high which creates our new stock one candle. We then get no confirmation and our second our third but on our fourth bar we get an aggressive move to the upside, and we have the body of the candle close to its high up one-third region. Now once we get these aggressive candles, we’re going to look for a pullback which we receive which could then allow us to enter into a trade. Now, the stop Hunt of our prior level support resistance occurred at 9:45, so a couple of hours into the London session and if we go over to the Euro-Dollar which is negatively correlated to the Dollar-Swiss we get the same process take place at the same time. So we have a previous level of manipulation which is a potential area of the equality and the 9:45 we get an aggressive candle through our identified area. Our next candle gives us a low-high then get another low-high. So we have a new stock one candle we fail to confirm on the next candle down even though it closes below the body of Stockman candle is not within its low 1-foot region. And then finally get an aggressive move down and our confirmation, so we’ve negatively correlated pairs were simply looking for the correlation of stock hunts but at the other end of the trade. If we see a bull trend in one manipulation going to be looking for a better trend and manipulation in the other. The identification of stock hunts within a relatively narrow timeframe in highly correlated pairs can help you to reinforce and confirm a trade before you pull the trigger. Now when we looked at our section on identifying the phases and trading in line with the smart money trend, we determined that phase 3 and Phase 1 are the most difficult to trade. When we’re in phase 3 which was level 3 accumulation you learnt that we would trade both sides of the market. And this is because there was no identifiable trend to the up or downside and the market stayed within a relatively tight range until the breakout and the formation of Phase 1. Now because this is the most challenging phase of the smart money cycle correlation and the identification of stock once is a great tool to assist you when the market is within these ranges. Because if we’re trading both sides of a market, we have a disadvantage because there is no cycle so if we identify at high probability area that the stock hunts are taking place within two correlated pairs and we’re in phase 3 or level 3 accumulation. This can add further confirmation and also a reinforcement that the probability of your trade will be a success so currency correlation can help with the daily intraday trading. As long as we’re apparently in line with the smart money trend but for those more difficult phases such as a level 3 accumulation and the identification of phase 1, it’s a great tool to assist you in your analysis and your trade entry decisions.